The roots of the League of Women Voters go back to 1840, when Lucretia Mott and Elizabeth Cady Stanton met at the World Anti-Slavery Convention in London and made a pact to start a women's rights movement in the United States. Eighty years later, on February 14, 1920, Carrie Chapman Catt, president of the National American Woman Suffrage Association, spearheaded the founding of the League of Women Voters in anticipation of ratification of the 19th Amendment. Mrs. Catt saw the League as a way to educate newly franchised voters. She said women must keep informed "...human affairs, with their eternal change, move on without pause. Progress is calling you to make no pause. Act!" 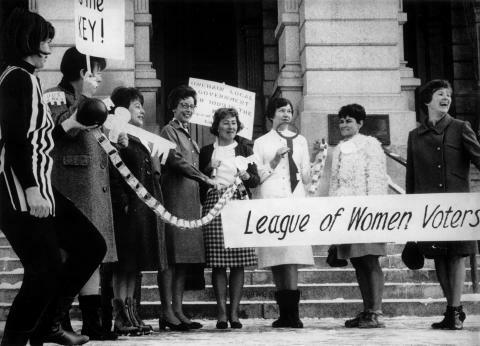 At the National Convention in San Francisco in May 1974, full membership in LWVUS was opened to men. At the National Convention in New York City in May 1976, a move to change the name to League of Voters was rejected because the LWV name would have been in the public domain, open to expropriation by any group. The first Montana League organizational meeting was held in Great Falls on April 26, 1920, and the groups made plans to establish by-laws for the Regional Convention, which was held in Butte on May 25, 1921. Mrs. A. F. Rice of Butte was elected president. The first convention established Montana League goals to work toward efficient government, the good of public welfare in government, and international cooperation to prevent war. The League adopted non-alignment with any political party, but possible support for legislation and policy. Another objective was to urge every woman to register to vote. Montana counted Jeanette Rankin, Maggie Smith Hathaway, Frieda Flegelman, Belle Flegelman Winestine, and Dr. Mary B. Atwater among its citizens who had been involved in the suffrage movement from the beginning. By 1952 local Leagues were active in Billings, Butte, Havre, Helena, Great Falls and Missoula, with a membership of approximately 300. On October 23, 1953, Irene C. Sweeny, National Organizer, met with 29 delegates from the six city Leagues to coordinate the local Leagues. Laura Nicholson was named State Chair of the Executive Committee. LWVUS required a State League to conduct a State Government study, with each local League investigating some phase of government. The study culminated in publication of Know Your State, used for many years in Montana classrooms as a text. On April 20, 1957, the first State Convention was held in Butte. The State League celebrated its 40th anniversary at Council in Hamilton in May 1994. Any individual may become a member of the League by joining a local League, or by becoming a Member-at-Large of the State League. Membership is open to all residents 16 years or older who subscribe to the purpose and policy of the LWVUS. Montana has four local Leagues: Billings; Bozeman; Helena; and Missoula. Click on these titles on the homepage under Local Leagues to find out more about each one.